Whether you’re putting in a brand new kitchen or looking to refurbish your existing one, the variety of kitchen cabinet styles available can be overwhelming. 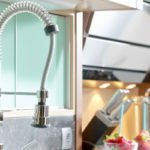 The cabinets are undoubtedly the most visible design elements in a kitchen, but if you aren’t careful they can also be one of the most expensive. Educating yourself about your options and being realistic about your budget will help you to choose the perfect style for your home. 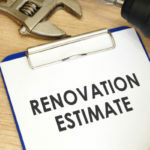 Before you begin, you’ll need to decide if you want your new cabinets to blend with the rest of your home’s décor, to be a little bit different in design, or to take a radical departure from the already existing interiors. The kitchen is different from the rest of the rooms in your home. It needs to be multifunctional and inviting. An ultra-modern kitchen might not blend well with a shabby chic living room, for example. In the end, make sure that your new kitchen suits your needs both now and in the future. 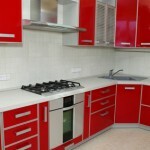 There are a variety of different style options when considering new kitchen cabinets. In general, the most popular fall into three common categories: traditional, vintage and modern. 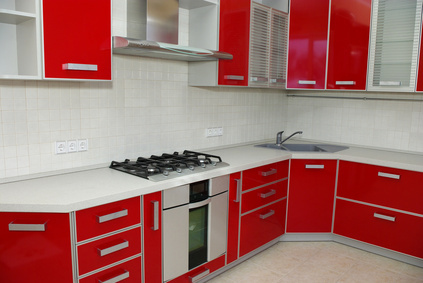 A few examples of modern cabinets are streamlined, colorful, European-style lacquered wood and sheet glass cabinets. If you’re on a budget, you can achieve this look for less with laminate cabinetry. For example, flat cabinets can be simple but stylish. The clean lines and minimalist form make it a great fit for homes that already have a contemporary or modern feel. Most flat doors come in decorative wood or laminate. 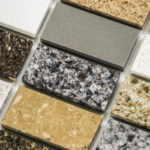 If you choose laminate, it is often more budget friendly and there are a greater variety of sheens and colors to choose from. Molded out of MDF (medium-density fiberboard), these doors are then wrapped in a type of plastic coating and baked in intense heat to create an impervious seal. Since it’s often mass-produced, thermafoil cabinets are very cost effective. Although durable, it can also be extremely difficult to repair any damage. They are only available in solid colors and imitation wood grain. Lighter colors can sometimes turn yellow from sunlight and heat exposure over a period of time. If you’d like something a little less edgy, traditional cabinets provide a more comfortable, homier aesthetic, including styles like Shaker, raised or recessed panels, and cathedral and arched cabinets. The most common door style in kitchens today is Shaker. This cabinet’s name is derived from the distinctive Shaker furniture style, which employs simple, clean lines and emphasizes utility. These style doors have became popular because their simple style works well with just about any home decor — from contemporary to traditional — with variations in wood, stains, paint colors and hardware. It’s easy to introduce this style into your kitchen even on the smallest of budgets depending on the wood, finish and hardware you use. Typically used on windows and interior doors, horizontal wood slats add a unique architectural style to kitchen cabinetry. But be aware that these cabinets come with a hefty price tag. On most louvered doors there is a space between each slat, making them perfect for cabinets that require ventilation. Lastly, vintage cabinet styles, which often feature decorative molding and beaded board, will give your kitchen an old-world feel. Unique and often breath taking, the details in the design elements can sometimes come at a price. If your dream has always been to have an antique-style kitchen, then you’ll fall in love with the distressed-look for cabinets. You can pick almost any style of door and choose to have the corners rubbed down or decide to have other distressing techniques done for that age-old look. This extra attention will cost you, though; typically there is a 15% to 20% up-charge for a craftsman to destroy your brand-new doors. If you love cottage style, then it doesn’t get any more cottage chic than beadboard. In the past, bead board was used as a decorative wall treatment before drywall, plaster, or paint became common features. For this cabinetry style, the center panel of the doors are made to look like traditional bead board paneling. 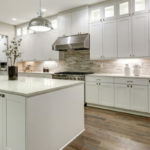 Although bead board that is all-white can give your kitchen a clean and open feel, all those little cracks and crevasses can be difficult to keep clean.